In the last 28 days, Julie has caught 4 wildebeest, 3 red hartebeest, 1 blesbuck, 1 mountain reedbuck and 2 hares. This amounts to more than R13 000 in less than a month. Although there are plenty of springbuck, the cheapest of the antelope, she has not managed to catch a single one. The springbuck don't run from the tiger like they do from a cheetah. They stay just ahead of her and are careful to stay in the open terrain. As she accelerates towards them, they jump and stot. The stripes on their flanks appear like a zebra's stripes to create confusion to the attacking tiger. As the tiger gets closer, they break the herd structure, each springbuck running in a different direction. This creates more confusion for the tiger. It is said that a cheetah will select a single animal and will not deviate from that animal until it has caught it. Perhaps this is the cheetah's response to the "scatter techniques" used by the springbuck. Will Julie learn to target an individual springbuck and does she have the speed across the open ground. Time will tell! Compare the springbuck hunt to the blesbuck hunt. Julie deliberately shows herself to the blesbuck. All the blesbuck run together, there is no break in the herd unit. Now Julie races unseen down a dry river bed. Anticipating the crossing point, she is waiting. In a cloud of dust she takes the blesbuck head on, an exceedingly risky maneuver. The blesbuck have done two things which the springbuck have not done. 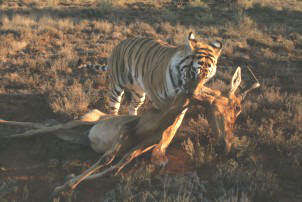 The blesbuck have fled the tiger and they have stayed together. As I view historical leopard footage, I realize the very first leopard kill I ever filmed in 1984, the mother leopard used the identical technique to Julie. Deliberately showing herself to a herd of impala, she shot around in front of the fleeing herd to complete a dramatic kill. Such was my excitement at the time, that I note the shot is exceedingly shaky. For a film maker your first leopard kill is like scoring your first century in a cricket game. After the unsuccessful springbuck hunt, Julie changes her tactics. She abandons the open grasslands and begins to coarse through thickets, rocks and tall grass. The new style rewards her a hare and a mountain reedbuck are caught unawares in the grass. I have seen lions in the Masai Mara do exactly the same. When the wildebeest herds disappear on their migration, the lions must turn to species like warthog to sustain themselves. Adaptability is the key and the ability to learn the behaviors of the prey is essential. At Londolozi and the Masai Mara a kill was a kill, for me prey had no value. At Tiger Canyons, it is different. I have added a calculator to my camera bag to add up the cost of the kills every time one is made. To kill a tiger you need a gun and some bullets, a trap or some poison. These are all relatively cheap. To restore a tiger to the wilds you need land, fences, game and money, lots of money. 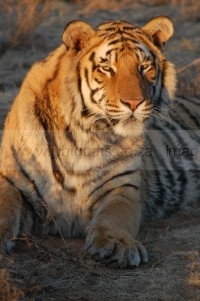 However what value does one put on a tiger that loves me, hunts with me, teaches and inspires me. I can assure you there is no value. No money in the world can buy that.